The Great Dane is one of the world's tallest dog breeds. A true gentle giant, the Great Dane has a playful, easy nature which can give way to bouts of silliness both as a pup and as an adult. Great Dane history from the 14th century forward reveals that the early Dane was a courageous and powerful hunter, capable of great speeds and swift attack. 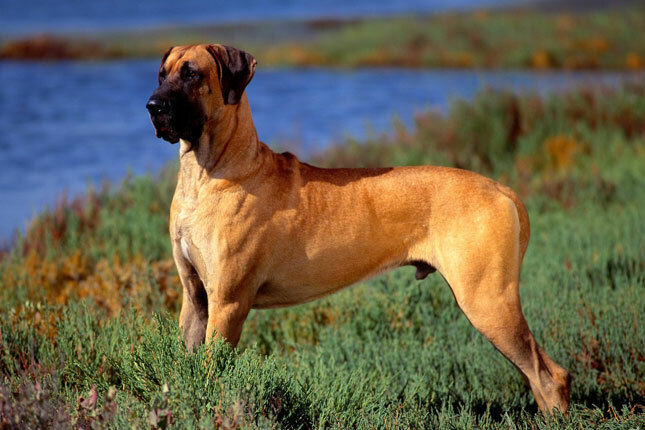 This muscular dog was developed primarily in England and Germany by combining the speed of the Greyhound, with the muscle and strength of the English Mastiff. 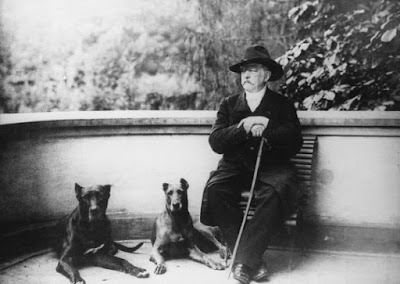 Many canine historians further link the Irish Wolfhound to this breed lineage. Over time and through selective breeding, Great Danes have been transformed from fierce hunting dogs into the noble, well-mannered giants we know and love today. They are the national dog of Germany and have been favoured by the likes of Chancellor Otto von Bismarck and Buffalo Bill Cody. One of the largest dog breeds in the world, the Great Dane can reach a minimum of 76cm (30") at the shoulder and weigh upwards from 54kg (120lb). This is a tall dog with a moderately deep chest and a square appearance. The head is rectangular in shape with ears which are large, triangular and floppy. Great Danes with colours or markings besides these six cannot be shown but regardless of colour, they all can make fine family pets. Be cautious of those breeders trying to sell you a 'rare' colour. 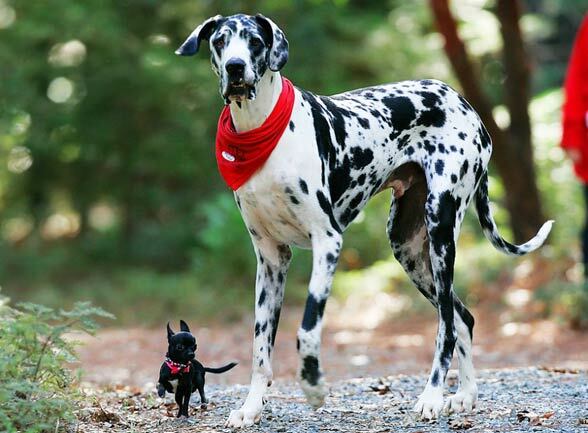 The Great Dane grows into a massive dog which should be considered before purchasing the breed. A Great Dane can grow well over 6 foot in height, when stood on their hind legs, so he is capable of peering over any garden fence. Great Danes are territorial and most will bark at strangers on their property, but once introduced, are friendly and affectionate. Owners say they are loving and loyal, and adore human company. Despite their size, Great Danes have a sensitive nature and this can easily lead to anxiety issues if they are not given clear boundaries early on. 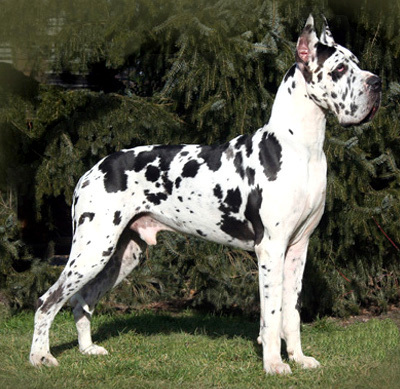 Bone strength is vital for giant breeds such as Great Danes. Start with a balanced diet as puppies and stick to the diet sheet provided by the breeder. Danes do have a slower metabolism than most other breeds and even other giant breeds so the accepted practice is to stay with a food that fits the 23%-25% protein range, feeding a well-balanced diet, which generally consists of a premium adult dry dog food mixed with raw mince. Just bear in mind that a growing puppy can eat up to 8 cups of dry food a day. Carrying excess weight adds stress to bones and joints and particularly impacts as they grow old. An obese or even a chubby Great Dane is not a healthy one. Puppies and young adults can develop growing or bone problems which are sometimes associated with an improper diet. The most negative aspect of the breed is a short life span. Deal only with a reputable breeder and make sure you see certificates with low-risk ratings for hip and elbow dysplasia, both inheritable defects causing degeneration of the hip or elbow. Being a deep-chested breed, Great Danes are vulnerable to bloat or stomach torsion and it is recommended to feed your dog smaller portions several times a day. Also don’t exercise him immediately after eating or drinking. Cancers are now part of the world of canines across many breeds and they are more readily diagnosed and can be treated. Great Danes do have a slightly higher prevalence to cancers compared to some dogs and Osteosarcoma, especially in a limb, can be a huge hurdle to overcome. You should consider whether you could care for a Dane with an amputation or nurse one through surgery and/or chemotherapy. If you have the room, Great Danes are good indoors, with little hair shed and usually content to stretch out on the floor or lounge as they love lying at (or on) the feet of their owners. A Great Dane can live as an outside dog but cannot be people deprived. They will seek the company of their humans and if it is not available, may show signs of anxiety or destructive behaviour. A naughty Great Dane doesn’t chew the chair leg, it chews the table! They do require more food than a Labrador sized dog, vet bills and medications will also cost more as this is a giant breed. If you decide to bring a Great Dane into your home you will need to be realistic of the costs that can be involved in caring for him. Pet insurance will help enormously with the costs that you will incur particularly with any major medical events. A Canine Bloat and torsion episode can range from $6,000 - $20,000 and finding these large sums of money urgently stretches any budget. All Danes slobber, some more than others. There is a gene in their make up which causes excessive slobber, some Danes have it, some don't - it is the luck of the draw! Some of the Danes with a finer head shape and tighter lower jowl will slobber less in volume but there is no guarantee. It is usually while they are exercising or overheating. Get used to carrying a 'slobber' cloth with you wherever you go. Adult Danes kept in suburban backyards will need a daily walk of 30 minutes. Many Danes are kept on acreages and will self-exercise. Dogs under 12 months of age should only have smaller amounts of exercise until their growth plates close. Great Danes require minimal grooming, although washing them can take some time! Much of the success in owning a Great Dane will come with responsible ownership and attention to early socialisation and training. Control of this huge dog is essential at all times in all situations, and most experts say Danes respond well to training. Puppy school is an ideal introduction, and basic obedience is very important. Although Great Danes who have been raised with children are usually very gentle, they are much larger than a small child even as puppies and "teenagers" and can be boisterous. Children must be taught the correct way to interact and parents need to monitor correct behaviour on the part of the child and the puppy. Dogs and children should never be left alone unsupervised.